If you decide that running a 5K is your goal, but you’ve never run before, trying to finish one by the end of your first week of training isn’t the best idea. ”The biggest mistake that new exercisers make is setting incredibly unattainable goals,” says Samantha Clayton, a certified personal trainer and former Olympic sprinter in Malibu, California. Starting your first week off by going for your first run in years, several days in a row, will most likely have you throwing in the towel by Wednesday. Success strategy: Before you can run, you need to start walking first. “Small, simple and easy goals will build your confidence and help you to stick with it,” says Clayton. If, for example, your ultimate goal is to run a 5K but you’ve never run before, break down your larger goal into smaller, more realistic steps. Start off with brisk walking the first week, graduate to a walk/run combo the next, and then eventually progress into running longer distances until you are ready to race to the finish line of your long term goal. Success strategy: Just because you can’t see any visible changes yet, doesn’t mean your body isn’t changing. Instead of focusing on immediate visible gratification, focus on how you feel instead to stay motivated. Chances are you will start to feel better, have more energy, and slowly start to feel less winded and stronger before you’ll actually see your scale weight or dress size drop. “The truth is change takes time, so patience is key,” says Clayton. Most experts agree that it can take 6 weeks (or more) to begin to see external changes. Trying to make up for lost time in the gym during your very first workout is a recipe for disaster. Just because you were able to lift/sprint/jump like that in college, doesn’t mean your body is ready (or willing) to do it now! Trying to impress your workout partner (or yourself) by taking on more than your body can handle can lead to injury or a pulled muscle fast, says Clayton. If you are a gym owner or fitness instructor, you may want to protect yourself against financial losses incurred from injuries, in which case you should visit Fitness Gold for specialised insurance within the health and fitness industries. Success strategy: Be realistic about your starting level, and progress slowly from there. Just starting a strength training routine? Be sure to master new exercises with just your body weight first, and then add in light dumbbells once you are able to maintain proper form. “It is so important to do exercises right — one correct squat is better for your body than 10 poor ones,” says Clayton. Doing exercises improperly, leaning on handlebars of cardio equipment or even setting up weight machines incorrectly can easily cause strain or injury, sidelining you from future workouts. And don’t count on watching other exercisers at the gym to learn, says Clayton. Following someone that may look like they know what they are doing could be dangerous, especially if they aren’t a trained professional or working at the same fitness level as you. Success strategy: “Do your body a favor and learn the correct technique from the pros,” says Clayton. If you are interested in strength training, for instance, pick up a book like Weight Training for Dummies, pop in an instructional DVD or schedule a session (or two) with a personal trainer for professional help mastering new moves and key form tips. If one of your primary reasons for working out is weight loss, don’t expect to lose weight if you don’t change your diet too. One of the biggest mistakes beginner exercisers make is not realizing that dietary intake and nutrition are huge component of any exercise plan, says Michele Olson, Ph.D., professor of exercise physiology at Auburn University in Montgomery, Alabama. Success Strategy: In order to see visible changes in your body, pay attention to what you are fueling it with. Focus on foods that provide your body with the nutrition and energy that your body needs, especially now that you are exercising. And be careful not to adopt the ‘I burned it, I earned it’ mentality – it’s so easy to eat back any extra calories burned at the gym, and it takes less than five seconds! To lose weight, be sure to maintain a daily caloric deficit with both exercise and nutrition (cutting back 250 calories a day from your diet and burning an extra 250 more can help you drop one pound per week, for example). You may also need to amp up your water intake too, especially if sweating has become a regular habit. 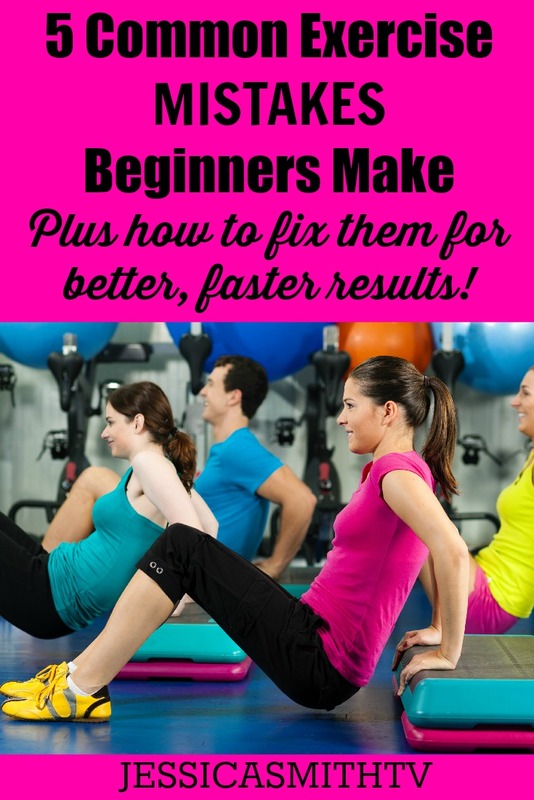 Need more guidance and structure when it comes to starting your exercise plan? Check out our “Walk On: 21 Day Weight Loss Plan!” It has everything you need to succeed with weight loss and working out as a beginner, plus includes options to continue to challenge and change your body as you progress. #1: Setting Unrealistic Goals & #5: Understanding That Diet And Exercise Are A Couple. When I started exercising – I figured I could lose 10 kg in 2 months just by exercising. That didn’t really work, I only lost 1.5kg after those 2 months. #2: Expecting To See Results Right Away. #3: Doing Too Much, Too Soon & #4: Using Improper Form or Technique. Even though I had been inactive for a very long time, I still rembered playing volleyball in college and being able to run 40 minutes and be barely winded. So I always had the optimism that I could do a certain amount of exercise, and it worked… until it didn’t. A few weeks after starting my exercise routine, my knees started to hurt. (Rehab exercises to strengthen the muscles around the knee helped.) Another few weeks later, my lower back started to hurt. (Neutral spine at all times during exercise and the rest of the day, plus strongly limiting any kind of forward bending helped. My new best friends: the squat and the lunge that replace forward bending.) Each injury made me slow down but still not enough since I’ve recently hurt both my elbows. Luckily all those injuries were light and I was able to fix them with a little rest, better posture and rehab exercises. I’ve been exercising for 5 months now and I’m still learning what my body can handle. I so wish I’d stumbled on that article before I started exercising. It might have convinced me to start my fitness journey with a gentle walking program. Hello Jessica – I’m your BIG fan and I keep sharing your link with all my friends. I work & live in Africa and you keep me great company. I stopped exercising the past couple of months thou… too much travels for work and family visit. Hi, I just got the 4 DVD ultimate workout for weight loss set and don’t exactly know where/how to start. I need to get back into shape after a long absence and have about 30-40 minutes a day. Can you please give me a week or two of workout combos from the DVD set I bought?